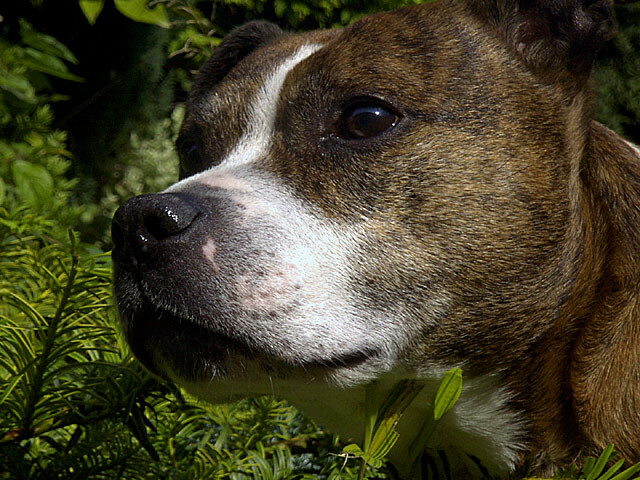 Jazz, my Staffordshire Bull Terrier in the garden, August 2002. Awwwww. . .this photo makes me so sad! What a beautiful dog with such devotion in his eyes. I have a 14-year old best friend too. So far, she's doing good, but at 14, I'm keenly aware of the possibility of having to say good-bye before too too long and how sad that day will be! I love your tribute to Jazz! It's beautiful! Message edited by author 2007-05-16 12:20:13. Proudly hosted by Sargasso Networks. Current Server Time: 04/20/2019 02:13:37 AM EDT.